On this understanding of characters, generation didn't cease at the start of play, with the rolling of ability scores, the tallying of hit points, and the choice of equipment. Those were simply the starting conditions of a character, the basic facts that a player was given, and from which his character would evolve over time. It was only through actual play that a player began to get a sense that Sir Justin Case, his randomly rolled fighting man, whose 13 Strength was his highest stat, was more than a collection of numbers on a sheet of paper. By surviving adventures, undergoing in-game hardships at the hands of a "challenging" referee, and growing in experience, Sir Justin became what we'd today recognize as a character. At the start, he really was little more than a "playing piece," a bunch of game mechanics through which a player could interact with the game world. 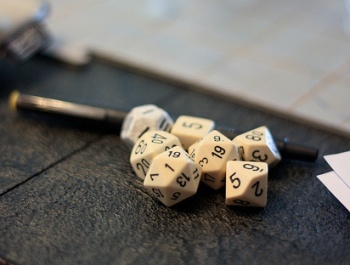 If his player succeeded - and the dice gods smiled upon him - a bunch of game mechanics could transcend his origins and possess all the depth and breadth we typically associate with literary or cinematic characters. This is, of course, assuming that's what his player wanted. Many early roleplayers weren't all that interested in "getting into character," preferring instead to treat RPGs as a kind of open-ended tactical wargame that also included elements from strategy games in terms of planning and logistics. This approach existed side by side with those that treated characters as a vehicle for pretending to be another person in an imaginary world. As the hobby grew and became more mainstream, casting aside its wargaming roots (or at least downplaying them), it was the second approach, the one about pretending to be someone else, that came to be emphasized and indeed promoted as the unique feature of RPGs. That's perfectly understandable, as most people, from children to adults, instinctively understand the notion of playing "cops and robbers." From a marketing standpoint, it's much easier to sell a game if you can compare it to something people already grasp. And nowadays, with the mass marketing of fantasy and science fiction, both of which were more marginalized at the dawn of the hobby, it's even easier to compare roleplaying to "writing your own fantasy novel" or something similar. It's a very straightforward way to present roleplaying games to those unfamiliar with them or their history. Still, for those of us who've played these games for three decades or more, it can be disappointing to see the older understanding of character disappear. I still prefer to roll up my characters randomly and run with them, seeing them live - or die - as a result of the choices I make. There are, at the start, no grand plans or extensive backstories, just some ability scores, a name, and a willingness to let the character tell me who he is as I use him to experience an imaginary world. Sometimes, it's true, this approach yields few or unsatisfying results, but, when it works - and it often does - the resulting character is one I'd never have created through planning beforehand. He feels like someone real, or at least as real as you find in novels and movies. That's good enough for me; here's hoping I'm not the only one who feels this way.